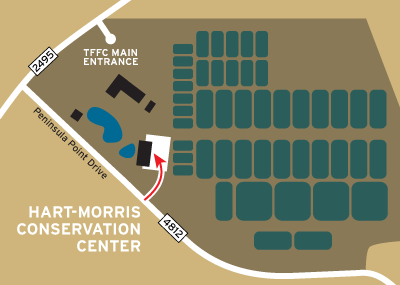 The Richard M. Hart and Johnny Morris Conservation Center significantly expands TFFC's ability to deliver educational programming and host community events and conferences. The $2 million, 14,000-sq.ft. facility was built entirely with donated funds. The center houses offices, classroom space, a conference center and a game warden museum. It is equipped with full audio-visual equipment and a catering kitchen. The facility is dedicated to conservation and hunting and fishing education, primarily for school children. It may also be rented for public and private events. From Loop 7 outside Athens, take F.M. 2495 east about 3 miles. After crossing Lake Athens, take the second right (Peninsula Point Drive, CR 4812). Drive 0.2 mile along the chain-link fence on your left and turn left through Gate E. Drive straight ahead to the parking lot; the Conservation Center is the first building on the left. The idea of a building with classroom, meeting and office space was first proposed in 2002. In partnership with Bass Pro Shops and Schooling for Bass, a unit of the Friends of TFFC, banquets and auctions were held in 2003, 2004 and 2005 to raise private funds to build the center without the use of state money. Johnny Morris gave a $650,000 challenge grant in 2004 which was exceeded in 2005. Construction was completed in 2007. Richard M. Hart of Dallas founded Schooling for Bass and led the fund-raising effort for the building. Johnny Morris is the founder of Bass Pro Shops. Other organizations and individuals contributing to the building fund were Kathie and Ed Cox, Jr., Eric Kincaid, ExxonMobil Foundation, Cain Foundation, Ginger Murchison Foundation, Hillcrest Foundation, Sheila and Walter Umphrey, Friona Industries, Hoblitzelle Foundation, Cathey and Don Humphreys, Texas Game Warden Association and J.B. Katz Foundation.